Design Principles of Metal-Cutting Machine Tools discusses the fundamentals aspects of machine tool design. 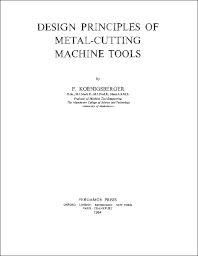 The book covers the design consideration of metal-cutting machine, such as static and dynamic stiffness, operational speeds, gearboxes, manual, and automatic control. The text first details the data calculation and the general requirements of the machine tool. Next, the book discusses the design principles, which include stiffness and rigidity of the separate constructional elements and their combined behavior under load, as well as electrical, mechanical, and hydraulic drives for the operational movements. The next section deals with automatic control, including its principles, constructional elements, and applications. The last section tackles the design of constructional elements, such as machine tool structures, spindles and spindle bearings, and control and operating devices. The book will be of great use to mechanical and manufacturing engineers. Individuals involved in materials manufacturing industry will also benefit from the book. 1. What is Total Energy?